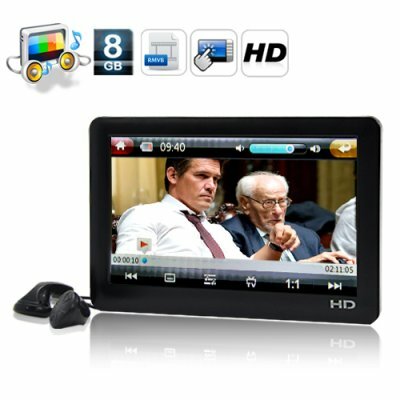 Successfully Added HiMedia - 8GB HD MP6 Player with 4.3 Inch Touchscreen to your Shopping Cart. Listen to music and watch high-definition movies on the go with the HiMedia HD MP6 Player. Complete with a beautiful 4.3 inch screen, 720P AVI and RMVB playback, and a wide range of supported file formats, the HiMedia is perfect for those who demand the highest quality digital media experience. The HiMedia MP6 Player comes with everything that anyone could possibly want in a portable digital media player. Watch how the pixels merge together to bring you high-definition 720P video playback (for AVI and RMVB files only) like never seen before. What else sets this apart from the iPod Touch, Zune, and all of those other "name brand" players? Superior Video/Music Selection: With the HiMedia MP6 Player supporting today's most popular file formats (including AVI, RMVB, WMV, MPEG, ASF, DAT, VOB, MP3, WMA, APE, FLAC, and many more), you don't need to worry about file conversion and compatibility, just transfer your files and start enjoying your favorite videos in amazingly high quality! No Software Necessary: With the HiMedia MP6 Player, there is no proprietary software necessary or DRM restrictions to worry about. Simply load your files onto the player with a simple USB connection to your computer (like you would a USB flash drive) and you're good to go! No iTunes software or anything else needed! Tons of Cool Features: The HiMedia MP6 Player comes with FM Radio, 8GB of internal memory (as well as support for a micro SD/TF card to carry another 32GB), voice recording, AV out, and much more. You won't find these on your brand name MP6 player! Is this an MP4 player or an MP6 player? "MP6 player" is a marketing term that refers to MP4 players that play RM video files without conversion. This MP4 player supports RM files without conversion, so you can certainly sell it on eBay as an MP6 player. This digital media player is so good we should be calling it an MP6 or even MP7 player! headphones are a little short but quality of sound is good enough. on 2011-01-03 18:28:33 Unbeliveble ! Completely Satisfied ! I ordered this product on Wendsday 29 december and arrived to me in Switzerland on Friday 31 december! The mp4 works very well, it's full HD and the processor it's fast too! it's really a good product, and Chinavasion great service quality ! !